The Holidays are finally here! Immerse yourself in the spirit of the season at Town Center from November 23rd to December 23rd. Bring the entire family to our winter wonderland and enjoy activities for the kids, live entertainment, our new Artisan Village, and much more! Bring the entire family to 192 Central Park Ave for a day full of holiday cheer! In Santa’s Cottage you can write letters to Santa, enjoy arts & crafts like ornament decorating, and take pictures with the one and only – Santa Claus! Don’t worry, Santa Selfies are pet friendly, so you can bring your furry family member along for the photo op too. Getting your shopping done in Town Center? We’ll wrap your gifts complimentary. Even better, if you spend $30 or more in Town Center we’ll pay for your Lyft ride home! You can also partake in our Festival of Trees competition where you’ll travel to participating businesses and vote on your favorite holiday display for a FREE dessert! Bring your Toy’s for Tots donations to the Sandler Center for The Performing Arts through December 9th. Our “Snow Globe Spectacular” kicks off on December 7th! 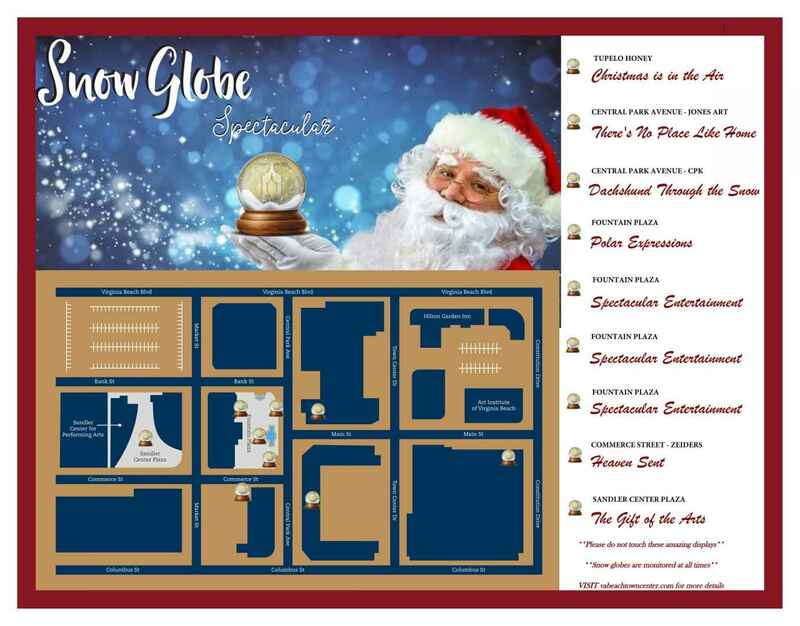 Visit the amazing life-size snow globes filled with artist Christmas Tree scenes and live entertainment (See below for snow globe map). The magic of the holidays comes to life with dancing ballerinas, a playful elf, marching toy soldiers and frosty royal musicians throughout Town Center! Admire the beautiful Fountain Plaza Christmas Tree as it’s lights dance to the holiday music while children young and old can shop our “Artisan Village” for beautifully hand-crafted gifts!